Forget all roads leading to Rome. Now that I had an affidavit certifying my mental stability - signed in triplicate - in hand, all my leads seemed to point me in the direction of Olympus. There were at least three threads I could recall to follow up on within the community's walls. Dibbs had suggested a man named Trippet there could assist with repairing the broken conveyor belt in the power station. Edison might be able to help figure out how to get said station providing power once more. I'd also been told Carnegie had been working on building another cannon to make the return trip to Earth. Though he had run out of iron for the necessary steel, seeking him out could still be beneficial, and he too was purportedly to be found in Olympus. Appreciating the bounty of Martian vegetation. And so, with my course decided, I set out once more to deliver my affidavit to Nathaniel and gain entrance to the gated community. Sticking near the canals had been both easy to navigate and relatively safe in the past, so I stuck to the pattern. 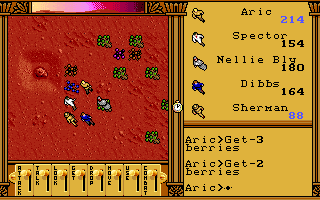 It indeed proved to be an uneventful journey, and we spent some time marveling at the Martian vegetation - the forests, the wriggling worm grass, the berry bushes. The glut of levels I experienced in my last session seemed to be dwindling back to what felt like "normal" levels as well. No longer was I seeing at least half my party get stronger when I rested - granted, that was partly because the recent addition of Sherman to the group had increased its size, but I was, at least, beginning to catch up to all the experience I'd been gaining. Nathaniel was quick to open the gates and welcome us to Olympus once he had verified the three signatures. I suspect we were also helped in no small part by the fact that one of the signers was indeed now traveling as part of our number. Olympus proved to be a relatively bustling community, and we spent a good while exploring its nooks and crannies, and talking to its citizenry. We learned much from the many notable figures we found there. Marie Curie, for example, told us of her research into radium, how the Martians may have used it to power some of their machines, and the affinity the Martian worms seemed to have for the substance. Apparently the creatures grew quite rapidly when exposed to it, and so the physicist hypothesized we might be able to conclude the presence of radium wherever we found abnormally large worms. She invited us to take the lead box in her laboratory with us so we could collect our own samples should we find any. Several others in the community talked with us about potentially useful things - Teddy Roosevelt told us of the value of fingerprint evidence and how it led him to suspect Rasputin to be the culprit of the cannon's early fire. Sarah Bernhardt (fascinating woman, incidentally, I did some further reading about her out of curiosity, since I didn't know much about her, and man is she an interesting figure!) mused about her more artistic pursuits and how beautiful she found Martian culture, lamenting its loss and wishing there were a way to preserve their race. Trippet talked with us about the canals, positing that the Martians may have melted part of the ice caps for water - Peary seemed to agree, telling us how the ice there seemed irregularly formed when we chatted about his explorations of the planet. But more than anything else, talk in Olympus seemed to revolve around the Dream Machines. 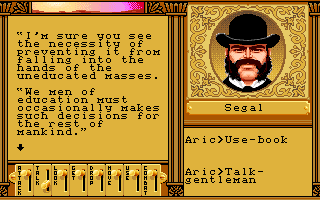 Segal, the leader of the colony, insisted on us avoiding the machines, talking about the madness that had afflicted those who had used it at Elysium, and a dangerous man in Hellas with a working Machine. He had ordered the one there in Olympus destroyed and guarded, and that seemed to be that. Edison, however, still seemed to be interested in its workings - he had had a chance to study its control panel before the Machine was destroyed, and thought he'd be able to rewire another control panel for its use. Perhaps there would be opportunity to take advantage of that fact, too. Legrande Couillard, the man guarding the ruined apparatus, suggested he'd be willing to let us see it if we could find his missing brother Jean, who had been sent to the Olympus mines and had not been heard of since. ...yeah, I'd believe this guy reads Machiavelli. As an aside, I also liked the various touches each character we met had in their domiciles, especially the books. Personally, I think you can tell a lot about a person by what they've got on their bookshelves, and it seemed an applicable precept within Olympus. My two particular favorites - a copy of The Three Musketeers in the building where Peary and Roosevelt were rooming together, and Machiavelli's The Prince displayed proudly in Segal's quarters. Both seemed rather fitting choices for the personages who were apparently reading them, and it made for that nice little extra bit of characterization. Well done, Martian Dreams. There were a couple things I could follow up on after chatting up the residents of Olympus, and the first one I decided to pursue was getting the power going. 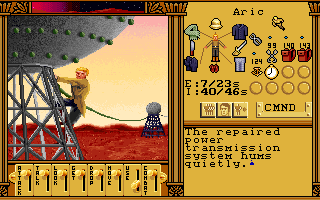 It seemed like it would be an important part of my own explorations of the Red Planet, and besides, I'd already been to the power station, so I at least knew where I was going and at least some degree of what to expect. Unfortunately, I hadn't thought to take the damaged conveyor belt with me when I was there, so I had to go back and fetch it to bring back to Trippet so he could repair it. (Yes, there was a lot of back and forth in this session.) Along the way I had my first brush with the dreaded oxy leeches, who stole oxium from me whenever they managed to land a blow. That just reinforced my decision to get the power running again - I'd need to do so in order to track down Cooter's oxium motherlode, and with my supplies dwindling thanks to leeches, it seemed all the more urgent to find a way to replenish them! After some running around, I managed to get the belt fixed and replaced, and once I had, Coker immediately got to work, mining a large chunk of coal and placing it on the newly repaired conveyor. But as the power wasn't running, it didn't go anywhere. There was plenty of smaller pieces of coal lying around, though, so I stoked the fires long enough to move one of the larger chunks far enough down the line for Stoker to take over. Once he'd done his job, the entire place sprang to life - the furnaces were hot and getting things moving. And with the power restored - at least for the facility, I still had to make sure the broadcast towers were active - I beelined for the doors I couldn't get past in my previous visit here. Sure enough, there were bins absolutely *full* of oxium, and I quickly replenished my nearly exhausted stash with as much as I could. And thus was the problem of oxium as both currency and means of keeping characters in fighting shape turned from a supply issue to a logistics one - these bins seemed inexhaustible, and so it became less a matter of finding enough and more a matter of making the trek back to gather some and ensuring I had the carrying capacity for it when I needed it. And I think this works well enough the way the game is set up, it still makes me work for my cash by making me return here, but alleviates not knowing where to find a supply when I actually need one. Next it was back to the surface through the other exit in the tunnels to check on the broadcast towers. Sure enough, they were in a state of disrepair, and making use of a spool of cable I'd found near the oxium bins, the pair of pliers in the toolkit we had brought with us, and Spector's pair of rubber gloves, Aric made short work of getting the entire planet crackling with power once more. That taken care of, I decided I'd need to make a pit stop at Calamity Jane's to restock on ammo, both Nellie and Spector were getting dangerously low. But I couldn't go back the way I'd come. Going back through the tunnels proved not to be an option, as steam vents were blocking the way. I'd have to take the overland route from where the towers were located. Navigating from there wasn't too much trouble, although it did lead to a bit of a crisis once Spector ran out of bullets completely. It was therefore very much a relief once I made it to Arsia, and could exchange a fair portion of my newly obtained oxium for some sorely-needed supplies. Once I was reorganized and restocked, I next made my way back to Olympus. It was high time to explore the tunnels there and seek out what happened to Legrande's brother in the mines. On the way, I stopped by a small room I hadn't been able to enter previously due to the power being out. Peary had pointed it out as some sort of transport system, and turning the power back on had seemed to activate the system once more. That would certainly come in handy when I wished to explore further, but for now, my steps led me to stick close. 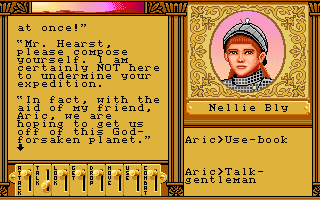 On my way to the Olympus mines proper, I bumped into Hearst, who wasn't much of a fan of Nellie's on all, on account of her employer. 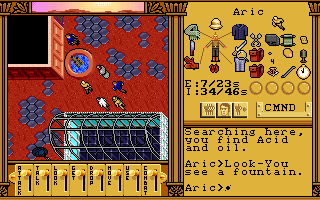 After a slightly tense introductory conversation, he talked to us of his collection of Martian artifacts, including a stone known as "azurite" that was apparently yet another kind of power source. He said he would be willing to trade it for photographs of the cannon from the top of Mount Olympus - he'd already sent one man to get some, but he had yet to hear from him. It seemed I had somebody else to look out for in the vicinity, and exploration of the mountain quickly revealed his fate. Past a large number of proto-Martians we fended off, we found his body with his camera lying close by. After taking a moment to pay our respects, we fetched the camera and delivered it back to Hearst, who then told us Méliès at Elysium could probably retrieve the photograph itself from the camera plate. Of course, we remembered what we had been told about those in Elysium... doing so may not be as simple a task as it first appeared. That was for later, however. We still had Legrande's brother to find. 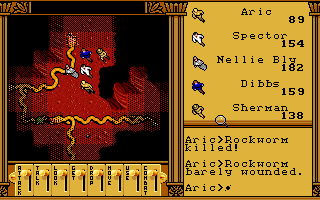 In the mines, we found Carnegie himself, who told us once again of his need for iron, as the Olympus mines had run dry. Jean had ventured deeper in the hopes of finding more, but had never returned. Duprey had found another source where we'd rescued him at Syrtis, but there was no way to transport it to Olympus. Perhaps, the steel magnate suggested, refilling the canals might provide a solution to the problem. In the meantime, we continued our search for Jean, and found worms in the process. Large worms... but we could muse on what that meant later. Fighting our way past the beasts, we did indeed find Jean, but too late. He was clearly taking his last breaths, and his final thoughts were of his brother, insisting we take his Masonic symbol back to Legrande. The poor man died moments later. Yup, those are some big worms all right. We pressed onward, remembering what Curie had told us about the effect of radium on worms. Sure enough, their size was indeed indicative of the element's presence, and we gathered several chips and a large block of the substance before leaving the mines once more. We returned to Olympus, picking up a control panel from the tunnels leading toward the mountain proper in the process, and gave Legrande his brother's symbol. The news clearly hit him hard, and he asked for a moment to himself in order to properly grieve. He assured us he would hold to his promise when we returned. We understood completely, and let him alone. While Legrande attended to his sorrows, we brought the control panel to Edison, who made quick work of rewiring it for use in a Dream Machine. Which left us with a few options - clearly the Machine itself was our next object of investigation, but what was the ideal means of going about it? Hearsay around Olympus suggested Marcus in Hellas knew a thing or two about the Machines, and with the transport system up and running again, we'd have quick and easy access. Then there was Elysium. Was it possible we could learn something from those affected by the machine previously? Or should we just take our chance to examine the one here at Olympus while the opportunity presented itself? That was a decision I left for my next session, as I closed this one there. This was clearly necessary, but felt like it happened on my terms. I find myself musing on the differences in how Martian Dreams' plot is unfolding compared to the rest of the series. I think it's rather more linear than any of its predecessors, but it's doing so in a manner that still allows me to decide what's truly important. I always feel like I have several potential plot threads to follow up on, but several of them dovetail together in order to lead toward a particular point. Like how I started this post off - I didn't feel like I had to make my way to Olympus before at least attempting to follow up on, say, what I'd heard about Elysium, but I had multiple reasons for going there. Same could be said of restoring the power, many I talked to implied only after doing so could I fully explore what other potential threads they mentioned. And indeed, it's exactly the position I find myself in now - clearly the Dream Machines are involved in my next objective, but I have at least three ways to figure out just how. There's clearly an order of operations at play in the game, or at least a stronger one than in previous games, but I'm finding I quite like its means of doing so. Rather than giving me one clear path, it drops a lot of bread crumbs in several directions, and gives me indications several of them cross at certain points, thus increasing its importance. Why follow one thread at one location, when visiting another allows me to follow up on three or four? It feels like the choice is still mine as to where to go and when to do things, even if, in some sense, it's also clear the game wants me to follow a more strictly defined path than the rest of the series has done. I think it's proof that linearity isn't necessarily a bad thing in and of itself - it's how it's approached that makes a difference. 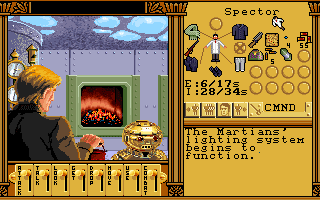 I certainly wouldn't call Martian Dreams a less enjoyable game just because it's not quite as "open" as, say, Ultima VI was. It's just a matter of approach. Of course, I still need to decide which thread to pursue now. But that's a subject that can wait until I fire up the game again. 'Til then!